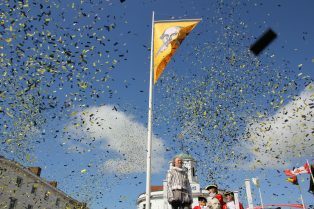 Shakespeare’s Birthday Celebrations will be an exciting blend of old and new in 2018 as the town’s biggest annual event is set to become even bigger. Three days of fun and spectacle for both visitors and local residents include the UK’s first National Living Statue Championship taking place through the weekend and an exciting Community Literary Carnival Pageant which will bring a whole new dimension to the traditional Birthday Parade on Saturday 21st April. And now is the time to turn your plans into action and get involved in a great carnival experience. Stratford-upon-Avon Town and District Councils, overseeing the festivities again this year for Shakespeare’s Celebrations, are warmly inviting locally based groups of all shapes and sizes to take part and help make the inaugural Shakespeare Birthday Literary Carnival Pageant a real success. 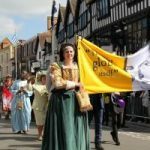 The Mayor of Stratford-upon-Avon and the Chairman of the District Council will judge the Literary Carnival Pageants independently before they leave New Place to embark on their procession through the town. The winning entry will be announced at the end of the Birthday Ceremony to the gathered crowds. The victors will receive a cheque from Literary Carnival Pageant sponsors, Bell Court, and a trophy which they will retain for one year. Each group’s presentation for the walking pageant will take a literary work of fiction as its theme. There is no limit to the number of participants in each tableau, and the only stipulation is that all participants should be in costume and each and every tableau should be representative of the chosen work of fiction they set out to portray. And be suitable for a family audience! Tableaux inspired by characters from such luminary authors as Charles Dickens, Jane Austen, Roald Dahl, AA Milne, Sir Arthur Conan Doyle, JK Rowling, or the Bard himself, William Shakespeare, will follow the Birthday Parade through the town centre to Bridge Street. Passing ‘Mr Shakespeare’, he will hand each group a feather quill symbolising his literary genius being handed down to all aspiring playwrights and authors thereafter. Once the Carnival Pageants leave the arena by parading down Bridge Street into Waterside, there will be the opportunity for those who wish to follow the Civic Parade to Holy Trinity Church to lay flowers at Shakespeare’s grave. Right across town, there is plenty to see and entertain through the weekend, including the Living Statues ‘performing’ in Bancroft Gardens prior to judging on Sunday afternoon. For more information about the National Living Statue Championship being organised by LSD Promotions, working with Shakespeare’s Celebrations, visit www.lsdpromotions.com/statues.